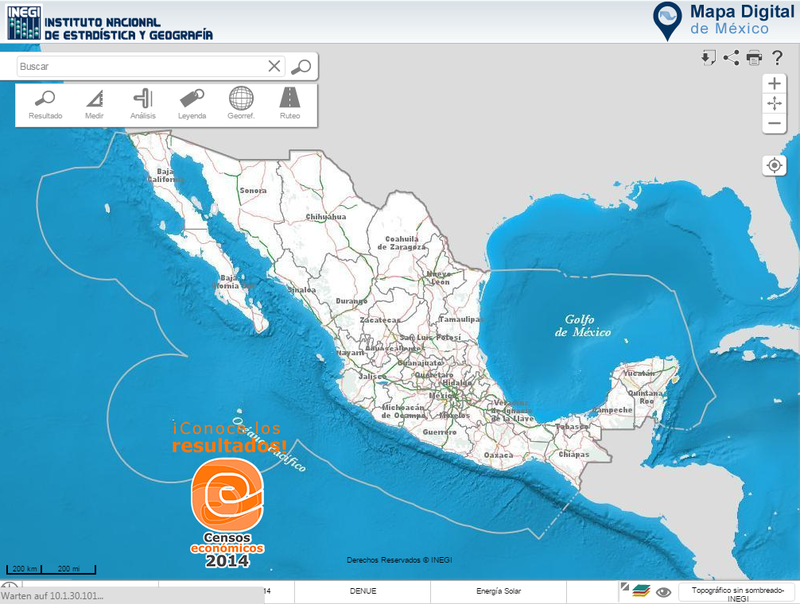 During the 8th GeoSUR Meeting, held in Cartagena de Indias, Colombia, the Digital Map of Mexico developed by INEGI (national member of ICA in Mexico), was awarded. GeoSUR is a program that maintains a network of geographic information in Latin America and the Caribbean where eighty participating institutions operate map services that are currently linked to the regional portal. The award recognizes data application, service development, or geospatial information products having particular characteristics of innovation and relevance. In this edition, it was awarded the Digital Map of Mexico, given its easy access and its use of spatial data – aspects that stood out among the various proposals in the competition. 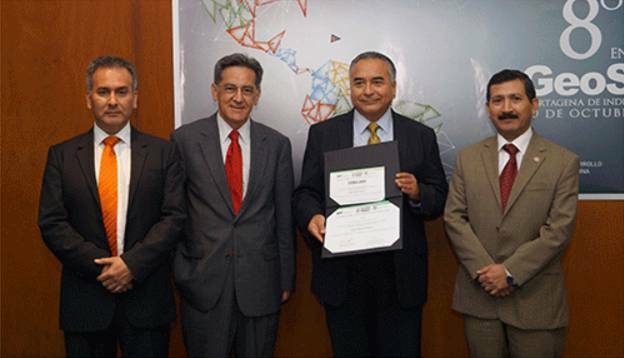 Mr. Carlos Guerrero, Director General of Geography and Environment of INEGI-Mexico, showing the 2015 GeoSUR award, given to the Digital Map of Mexico. On his right Santiago Borrero, GeoSUR Program Coordinator and on his left Rodrigo Barriga, Secretary General of the Pan-American Institute of Geography and History (PAIGH). On behalf of INEGI, the award was accepted by geographer Carlos Guerrero Elemen and Director General of Geography and Environment, who also presented three papers: Progress in Caribbean Project (proposal by the National Section in Mexico); Integrating Statistical and Geographical Information, and Open Geospatial Data by INEGI. 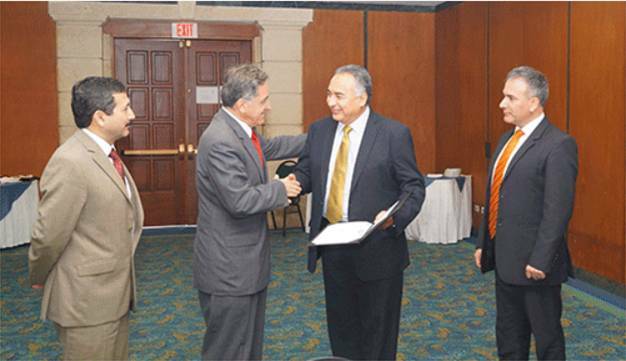 Mr. Carlos Guerrero, receiving the 2015 GeoSUR award from Mr. Santiago Borrero Mutis. My specific thanks goes to Mrs. Astrid Dawson from HERE. She has participated at the ICC 2009 in Santiago de Chile and since then stayed in close contact with ICA, although she was promoted with Nokia and later HERE to responsible positions. 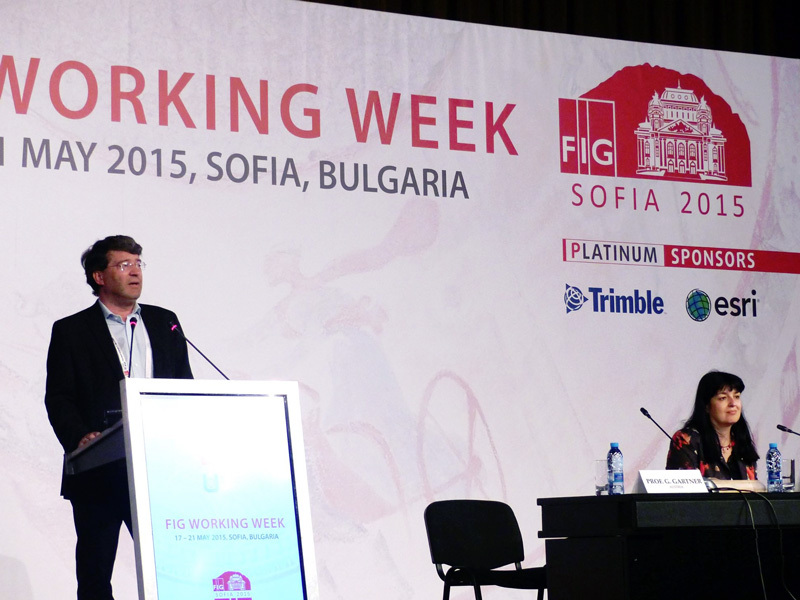 FIG Working Week 2015 was held with 1.000 participants from 68 countries from 17–21 May 2015 in Sofia. ICA was very visible at the event. President Prof. Georg Garter gave a keynote speech in the plenary session entitled “Modern Cartography”. The conference also included an ICA session and a Cartographic Exhibition of Wall Maps – held in celebration of International Map Year. In the ICA session, ICA President Prof. Georg Gartner, Past-President and Commission Chair Prof. Milan Konecny, Commission Chair Prof. Philippe de Mayer, Prof. Bashkim Irdisi and members of the Bulgarian Cartographic Association (BCA) presented their last cartographic achievements. All papers and presentations can be found on fig.net. 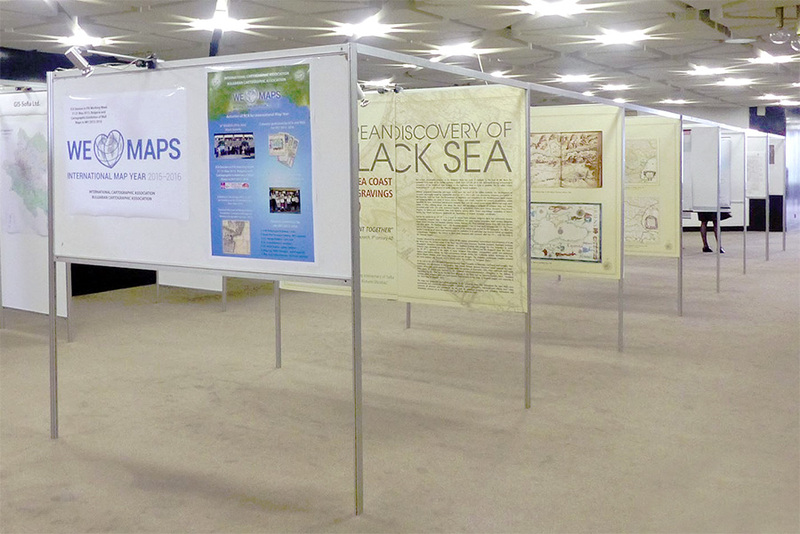 One of the most popular places in the National Palace of Culture during FIG Week was the Cartographic Exhibition of Wall Maps. Many participants were delighted to see such an exhibition and congratulated ICA and the Bulgarian Cartographic Association for the organization. The exhibitors received certificates for the participation and a special IMY calendar produced by the Bulgarian Cartographic Association and the Military Geographic Service. More photos and information are available on the Facebook page of the Bulgarian Cartographic Association. Iran: Dr. Alireza A. Ardalan is the new director of the National Cartographic Center (NCC) of Iran, as of November 30, 2013. Dr. Ardalan comes from the academic sector (Full Prof. in Geodesy); therefore, he has an emphasis on promoting research and technical issues in Surveying and Geomatics Engineering through mutual cooperation with other National Mapping Agencies. Chile: Colonel Rony Jara Lecanda became Director of the Military Geographic Institute of Chile (IGM), taking over from Colonel Leonardo Pérez Álvarez. Thus, Colonel Jara also now heads the ICA National Committee of Chile and looks forward to continuing the collaboration of Chile in the ICA. The contact details in the national members section were updated accordingly.